Why Did the Goose Cross the LIE? 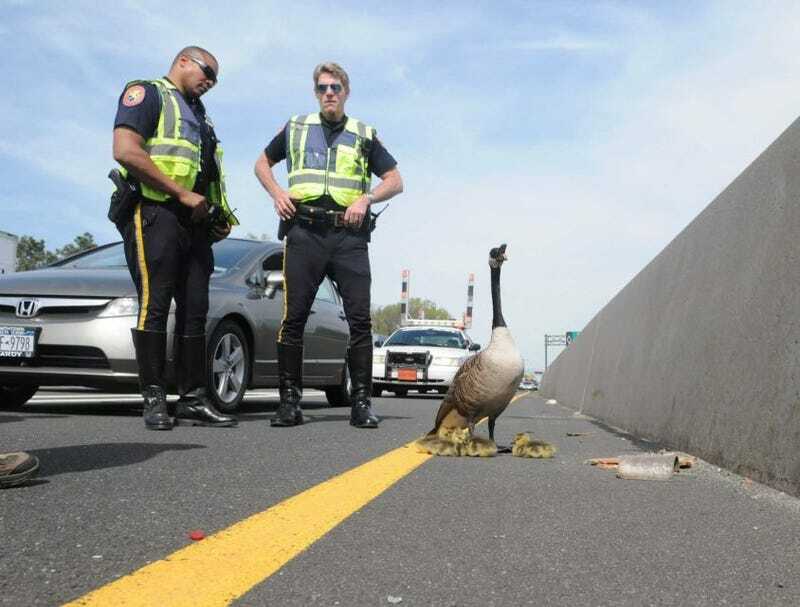 I have no idea, but somehow this mother goose and its four goslings made it through rush hour traffic as far as the HOV lanes on the busy highway, a little after 9 a.m. Monday. No word as to whether Long Island drivers, many of whom have shall we say mixed feelings about these veritable poop machines, actually tried to avoid hitting the little darlings or just missed. Anyway, Newsday reports that police came to the rescue and blocked off the lane for about 15 minutes while authorities boxed up the babies. Mama escaped, but a later reunion in their natural habitat nearby left animal experts confident the goslings were in good hands.